Italian painter and administrator. The son of Natale Mussini, chapel-master at the Prussian court in Berlin, he was sent to Florence, where he was educated in art, music and literature. He first studied art under his older brother Cesare Mussini(1804–79) and later, at the Accademia delle Belle Arti in Florence, he attended courses given by Pietro Benvenuti and Giuseppe Bezzuoli. He was more attracted by a direct study of the great Tuscan masters of the 14th and 15th centuries, whose works he admired for their purity and expressive dignity, than by the practice of copying from classical casts according to Neo-classical teaching. 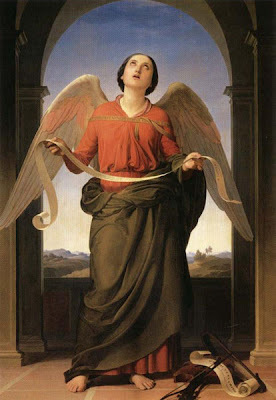 In Saul Anointed by Samuel (1835–6), Luigi Missini already displayed a sensitivity towards the theories of Purismo through his commitment to studying from nature and ignoring the practice of copying. In 1840 he won a scholarship to Rome, where he was introduced to Ingres and painted his first serious work, Holy Music (1842; Florence, Pitti), clearly inspired by Raphael. He returned to Florence in 1844 and, with his friend Franz Adolph von Stürler (1802–81), opened a small art school based on the workshops of the early Renaissance, where they practised a form of ‘free teaching’ in opposition to the strict rules of the academies. He fought in the Revolutions of 1848 and the following year decided to leave for Paris, where he became close friends with Ingres and those of his school, including Hippolyte Flandrin, Jean-Léon Gérôme, Auguste Gendron and the engraver William Haussoullier (c. 1818–1891).